From Kodak Originals to Folding Kodets and Brownie Boxes to Kodak Daylights, many camera collectors dream of adding these antique Kodak cameras to their collections. In 1878 George Eastman began developing dry gelatin plates for taking photographs. These plates were much less messy and easier to use then the wet plates that were used at the time. Over the next ten years, Mr. Eastman would continue to invent, improve and mass produce photographic film while developing cameras to use the new photography methods. In 1885, George Eastman and William Walker patented a device to hold and advance rolled film inside a camera. The following year, Mr. Eastman introduced the Eastman Detective Camera which used the Eastman-Walker Roll Holder. The camera did not meet with much success as it was difficult to use and mass produce. During the next two years events would take place that would change photography forever. The Kodak name, which was chosen because George Eastman liked the sound of the letter K, was trademarked in 1887 and a new era of photography was about to begin. Advertised to the public with the slogan You press the button, we do the rest sales of this camera were aimed at amateur photographers of the day. At a cost of $25, the camera was sold loaded with film to take 100 exposures. Once the film was finished, the camera was mailed back to the company where the 2 ½ inch prints were developed and printed. The camera was reloaded, which needed to be done in a darkroom, with fresh film and returned to the customer along with the prints, for a cost of $10. Although the price at the time was not inexpensive, the camera became very popular because people did not have to bother with the technical processes and chemicals involved in developing their pictures. Also included on this website are similar lists of Brownie movie cameras and projectors, Hawkeye cameras and non-Brownie Kodak cameras, links on where to find film, spools, bulbs and manuals, how-to articles and much more pertaining to antique and vintage Brownie Kodak cameras. The oldest photography museum in the world, The George Eastman House International Museum of Photography and Film, is located in Rochester, New York. Located in a section of the restored Eastman mansion, the museum and their online website offers a wealth of information on Kodak technology and photographic and film history dating back before the invention of formal photography in 1839. 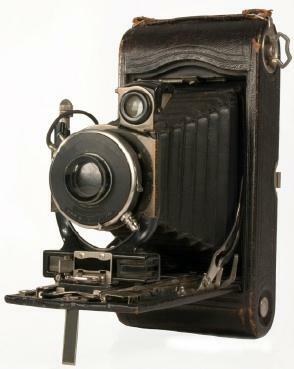 The Photographist is an excellent website featuring a chronological or alphabetical list of 46 antique Kodak cameras. Each camera is highlighted in a short narrated video with excellent pictures of each example. It is accompanied by a written description detailing the camera and photograph size, original selling price and interesting facts pertaining to each camera. Online auction websites such as eBay and antique websites including TIAS, Ruby Lane and Go Antiques are excellent places to view antique cameras. Whether you enjoy collecting cameras, learning about the history of photography, or simply enjoy looking at cameras from the past, antique Kodak cameras are beautiful examples of the evolution of photographic technology.